CHARMING WESTSIDE HOME UNDER $750K! This 2bed/1bath “California Cottage” is ready to be called HOME. The property features NEW interior and exterior paint, NEW Quartz kitchen counters, NEW bathroom vanity, NEW kitchen/hallway floors, NEW landscaping, NEW front yard fence, dual-pane windows, and a 200 amp electrical panel. The living room and bedrooms have beautiful hardwood floors. The backyard is fenced in with an open patio and fresh lawn. There is direct access from the backyard into the detached 1-car garage. Centrally located a few minutes from downtown Santa Barbara and the beach. CHARMING WESTSIDE HOME UNDER $700K! This 2bed/1bath “California Cottage” is ready to be called HOME. The property features NEW interior and exterior paint, NEW Quartz kitchen counters, NEW bathroom vanity, NEW kitchen/hallway floors, NEW landscaping, NEW front yard fence, dual-pane windows, and a 200 amp electrical panel. The living room and bedrooms have beautiful hardwood floors. The backyard is fenced in with an open patio and fresh lawn. There is direct access from the backyard into the detached 1-car garage. 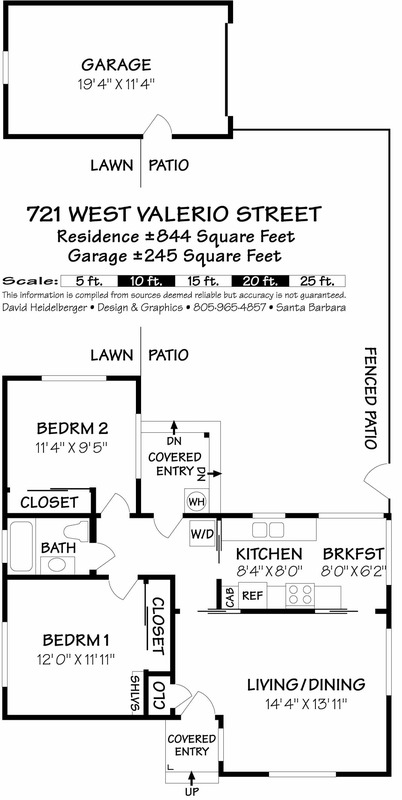 Centrally located a few minutes from downtown Santa Barbara and the beach. <ahref="https://vimeo.com/224787276">721 W. Valerio Street, Santa Barbara, CA from Mike Richardson, Realtors on Vimeo.